The CCAAA represents the interests of worldwide professional archive organisations with interests in audiovisual materials including films, broadcast television and radio, and audio recordings of all kinds. Although predominantly working in the public sector, we reflect a broad range of interests across the broadcast media, arts, heritage, education and information sectors. The professional archivists that the CCAAA ultimately represents work in institutions such as archives, libraries and museums at national and local level, university teaching and research departments, and broadcasting organisations. International Federation of Television Archives (FIAT/IFTA). The Minutes of the very first meeting of the Round Table can be accessed here. A major early project was organizing a Joint Technical Symposium of preservation experts from around the world, to be held every few years. The first JTS was held in Stockholm in 1983, with later editions in Berlin (1987), Ottawa (1990), London (1995), and Paris (2000). The Roundtable also produced papers on archival matters, and worked closely with UNESCO on audiovisual preservation. By 1999 it was felt that the Roundtable needed to become more proactive in shaping policy in the audiovisual archival field, to include lobbying for greater preservation efforts worldwide. To accomplish this it was reconstituted as the CCAAA in 2000, and new members were added. These included the Association of Moving Image Archivists (AMIA, 2002), the Southeast Asia-Pacific Audiovisual Archive Association (SEAPAVAA, 2002), the Association for Recorded Sound Collections (ARSC, 2007), and the Federation of Commercial Audiovisual Libraries (FOCAL, 2011). During that period, some of the CCAAA member-associations discontinued their membership for a few years. 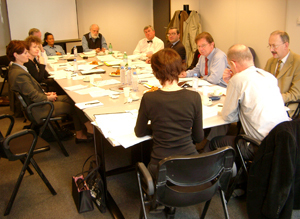 A CCAAA Board meeting in 2003 in Paris. 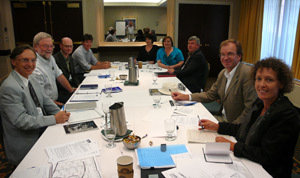 CCAAA Board meeting in Toronto in June 2007. The Joint Technical Symposia continued, with new conferences held in Toronto (2004, 2007), Oslo (2010), and Singapore (planned for 2016). The CCAAA was instrumental in the establishment of, and now manages, UNESCO's "World Day for Audiovisual Heritage" (observed on 27 October each year), which was approved in 2005 and first observed in 2007. It has also launched an "Archives at Risk" initiative to aid endangered archives, and taken positions on subjects as disparate as the impact of copyright on preservation and access and the repatriation of audiovisual heritage items to originating countries. Since the CCAAA is an "association of associations," its Board membership generally consists of the President and secretary general, or any other person officially mandated by each of its member organizations to represent it. The Chair of the Board rotates among the members, and there is also a Secretary General and a treasurer. All positions are filled by volunteers and there is no paid staff. The current Chair (2018-2019) of the CCAAA is Rachael Stoeltje, Director of the Indiana University Libraries Moving Image Archive, and member of FIAF's Executive Committee in charge of its Training & Outreach programme. This introduction is partly based on Benedict S. Olgado, "Creating and Sustaining a Platform for Discourse and Cooperation; The History, Development and Future Direction of CCAAA" (2011).